Sinclair’s homepage is evolving to better serve the community. Updates made to www.sinclair.edu on June 29 quickly and easily direct prospective students to request information, schedule a visit or apply to the college. The homepage slider provides further easy access to information about programs and services. Scroll down the homepage to find news and a calendar of events. 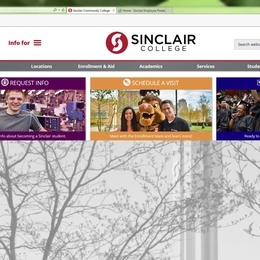 To access my.sinclair for current students and our.sinclair for faculty and staff from the main website, simply click on INFO FOR in the top left of the screen and a dropdown box will appear. For questions or feedback, email website@sinclair.edu.